Opposition leader predicts that elections will be held within a year and declares: I am worthy of being Israel's prime minister. 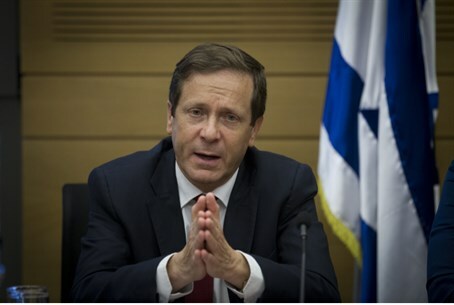 Opposition leader MK Yitzhak Herzog, head of the Labor party, predicted on Saturday that elections will be held within a year, and also said that he believes he is capable of being Israel’s next prime minister. The opposition leader then went on to say that he believes he is a worthy candidate for prime minister. Herzog’s comments come amid continuing tensions among members of the coalition on a variety of issues. In fact, last month it was speculated that Prime Minister Binyamin Netanyahu is preparing for elections in the spring, after he unexpectedly decided to drop his support for the Conversion Bill, which was introduced by Justice Minister Tzipi Livni’s Hatnua party. Further indications of tensions in the coalition surfaced last week, when reports said that one of Finance Minister Yair Lapid’s close associates had hinted to Prime Minister Binyamin Netanyahu’s associates that Lapid is considering quitting the coalition and forming an alternate government. Justice Minister Tzipi Livni (Hatnua) warned on Thursday that she is considering leaving the government, after Environmental Protection Minister Amir Peretz of her party last Saturday announced he is quitting the coalition. "Life in this government isn't easy," Livni said. "I ask myself every day if I need to be there and I suppose that one day the moment will come when I say 'enough.'" The timing of the reports about Lapid and Livni’s comments leads to speculation that Livni may throw her weight behind Lapid in his push to topple Netanyahu during the current Knesset coalition and before elections - in which indications are that the two will be soundly weakened. In his comments on Saturday, Herzog pointed out another strained relationship in the coalition, that between Netanyahu and Foreign Minister Avigdor Liberman. “The tension between them is significant, as we saw in the vote on the Israel Hayom Bill,” he said. “All the relevant parties are ready to get together in order to save the country, I do not rule out anyone, from Meretz to Liberman."